I was looking for something different in Christmas. The Christmas music we hear in malls is no longer meaningful. It’s repeated so many times, I don’t think about it. I was looking for good, spiritual singing, something new to me, and moving music. The wonderful women at the City Hall’s Christmas Around the World told me about the following churches. If you know about any of these choirs and their music, please let us know. It doesn’t matter if the lyrics are in Serbian or Tagalog. It’s the spirit that counts. The Slovaks talked about the Cathedral of the Nativity of the Mother of God at 257 Shaw St. (at Dundas). It has a mass and then a choral group, and separate services in English and Slovenian. There’s also St. Cyril and Methodius Slovak Roman Catholic Church in Mississauga. It has a mass on December 25. (5255 Thornwood Drive. Tel. 905-712-1200). 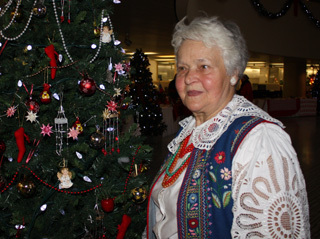 Poland’s Kolendy (Christmas carols) are famous, the Polish group said. There are good choirs at the Maximilian Kolbe Parish, 4260 Kawthra, tel. 905-848-2421 or 848-2420; St. Casimir at 156 Roncesvalles Avenue, tel. 416-532-2822. Web-site: http://www.kazimierz.org. E-mail: parafia@kazimierz.org. There’s also St. Stanislav at 12 Denison Avenue, tel. 416-504-4643. Its web-site is http://www.kolbe.ca/parafia_a/kontakt_a.html. This group was also enthusiastic about St. Michael’s Cathedral Choir School, which will be singing on Christmas Eve at 7pm and 11pm. Its Elementary Choir (Grades 3 and 4) has a tradition of singing on Christmas morning. The cathedral is at 200 Church Street between Dundas and Shuter. Tel. 416-364-0234. http://www.torstm.com/StMikes/. The Hungarians talked about St. Elizabeth of Hungary Roman Catholic Church, 432 Sheppard Avenue East, near the Bayview subway station westbound platform. Tel. 416-225-3300. http://www.szenterzsebet.org/en/indito-en.htm. They think there’s a concert on Dec. 12. Under their typical, star-shaped Christmas lanterns, the Filipinas said, “Look in Balita, the Filipino newspaper. Many Filipinas go to St. Catherine of Siena Catholic church. It has a Filipino choir and is at 2340 Hurontario St, Mississauga at Queensway. Tel. 905-272-1454. www.stcatherine.ca. E-mail: officestcathe@rogers.com. The Macedonians mentioned St. Clement of Ohrid Macedonian Orthodox Cathedral, 76 Overlea Boulevard west of Don Mills. Tel. 416-421-7451. http://www.stclementofohrid.com/. http://www.stclementofohrid.com/. The Serbians said their Christmas was January 7. This is also Christmas for Orthodox and Coptic churches. Its famous choir is the Kir Stefan Srbin choir. Its church is the Svetu Sava at 203 River Street. Tel. 416-967-9885; 416-944-3297. The Saint Elizabeth Scola Cantorum Choir, conducted by Imre Oláh, and The Children’s Choir of the Hungarian School, conducted by Margit Zydron, would like to invite everyone to their Christmas Concert followed by reception Sunday, December 12, at 3 PM at the Saint Elizabeth of Hungary Church. From the program: Handel – Messiah (parts), mixed Christmas compositions. Solists: Allison Arends, Jamie Henigman. Thanks for the details. I hope to be there at 432 Sheppard Avenue East. Ruth.